Saturday saw the Selamatkan Yaki crew bringing environmental education to a school group in the bustling city of Bitung for a new pilot programme we are engaged in. This extends some of the fantastic work that Tangkoko Conservation Education carry out in villages surrounding Tangkoko Nature Reserve, the critically important forest habitat for yaki and many other species. 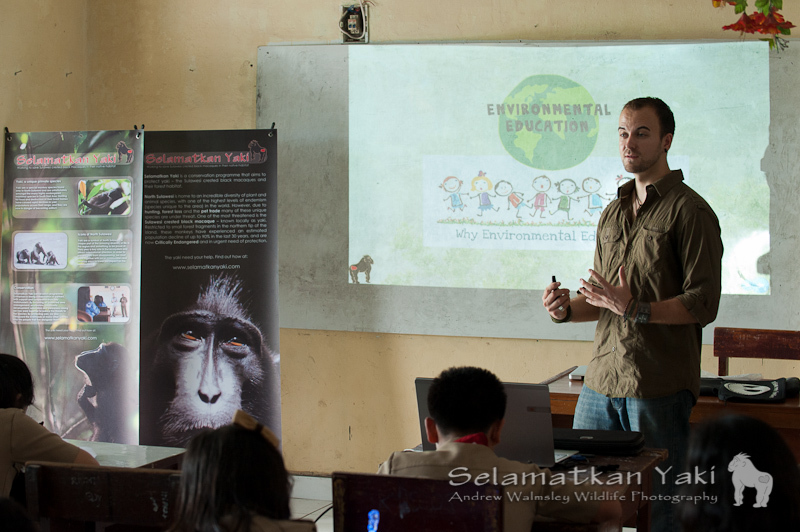 As we have emphasised previously, environmental education holds powerful potential to increase people’s knowledge of conservation, the threats endangering species such as yaki and the alternative actions which could be carried out to mitigate these threats; whilst developing a positive attitude and empathy towards conservation. By providing the next generations with appropriate, clear information about the current situation facing Indonesian wildlife, why it is important and what they can do to help, it is expected that a greater level of support for conservation activities and a reduction in negatively impacting activities will occur. So, there we were on Saturday afternoon, greeted by an eager group of beaming young faces, very much ready and raring to go! We began with an introduction to the new programme, explaining what we planned to teach them and why it is important. A short video clip from St Laurence secondary school in Wiltshire, England (which is in fact my own secondary school!) certainly got them in awe. If all goes to plan St Laurence will be part of a school connection beginning in September, a sort of pen-pal scheme whereby the students will share pictures, poems, ideas and stories about where they live and ways that they help protect the environment in their different homes. With this, the prospect of learning something fresh and new, and some themed games bringing out the competitiveness in them, the session took a lively appearance whilst the students became more and more animated. The quietest moments were during completion of our questionnaires, where we asked them a few simple questions about their knowledge, attitudes and awareness – all of which will be extremely helpful in comparing before and after our intervention. The project will run for 5 months every Saturday as a pilot project which will include environmental lessons for 13-15 year olds. Also included in the programme will be English classes and guest speakers from our partners and other local community members, interspersed with games and fun activities to hold their attention and keep them smiling. Topics to cover include ecosystems, biodiversity, pollution, photography, sustainable agriculture, oceans, captive animals, deforestation and reforestation. There will be several day trips including a beach clean-up, visit to Tasikoki Rescue Centre, tree-planting and a visit to Tangkoko forest to really experience nature first hand and possibly even catch a glimpse of the beautiful yaki! This should be highly engaging for the students, especially as many of them have never been to the forest. Keep a look out soon for a link to Prezi.com where the classes will be uploaded to have a sneaky peek at some of the content. Selamat bagi Selamatkan Yaki project, mudah mudahan biasa “mengubah ” generasi muda Indonesia lebih khusus pemuda pemudi Bitung, dan mudah mudahkan juga project seperti ini bisa masuk ke Minahasa….Proud to taking a part in Selamatkan Yaki..